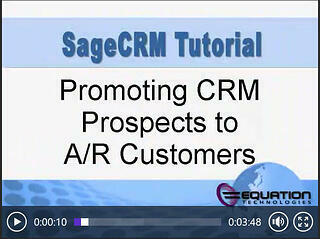 Equation Technologies has a series of Sage CRM Tips & Tricks videos. We will be posting them here on our blog periodically. Please be sure to subscribe to our blog to receive updates when new posts are added! Beginning with Version 5.5, Sage Accpac ERP includes the integrated SageCRM Customer Relationship Management System. This powerful combination forms the foundation of the Sage Accpac Entrerprise Suite. The integration between these two systems can be found in many levels and in this tutorial, we'll start with the basics of how to promote a prospect in Sage CRM to a customer in Sage Accpac.